Conservatives Rejoice Over Boehner Resignation, Say 'Pressure Was Working' : It's All Politics House Speaker John Boehner announced he is stepping down at the end of October. Rank-and-file conservatives reacted with glee — again highlighting the sharp GOP divide. 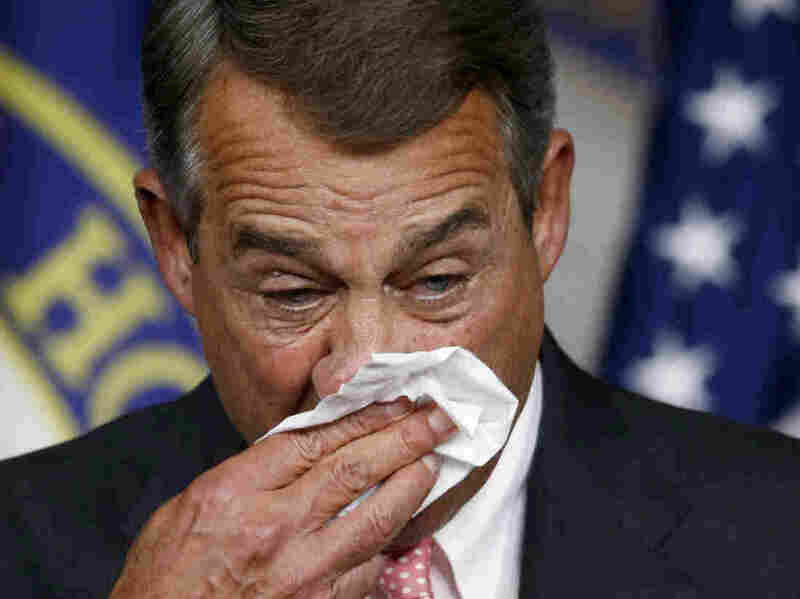 House Speaker John Boehner gets emotional and wipes his face during a news conference on Capitol Hill in which he announced he would be resigning at the end of October. It's a new day, and it might not be the same again. "My, oh my, what a wonderful day..." House Speaker John Boehner sang as he took to the podium in the Capitol Friday to announce his intention to resign as speaker of the House at the end of October. But he isn't the only one reacting gleefully — conservatives are, too. Boehner's resignation happens to coincide with the Values Voter Summit taking place in Washington Friday. Many at the conservative confab of religious voters were overjoyed. The crowd reacted with loud applause and a standing ovation when Sen. Marco Rubio of Florida broke the news to them that Boehner was stepping down. "The time has come to turn the page for a new generation of leadership," Rubio said, "and that extends to the White House." "Boehner resigned! Yes, indeed, we are very excited about that," said Karla Bruno of Virginia. "I don't think he's effective, and if you're not effective you might as well be gone. ... The fact that he resigned tells me that the pressure was working and the conservatives pushing for constitutional rights ... are winning." Daniel Brubaker, a Ted Cruz supporter from Northern Virginia, said, "I'm very pleased. The sort of leadership that he has failed to provide is concerning. ... Had his leadership been different or had he changed his direction of leadership, it would have been fine for him to remain, but, no." The fact that he resigned tells me that the pressure was working and the conservatives pushing for constitutional rights ... are winning. Brubaker added that the perception of the conservative wing of the GOP being oppositional is wrong. Instead, he said of Boehner, "The reality has been that delivering the agenda to the other side has been destructive — just many, many things that are harmful to the country." Todd Miller, the ad director for the Conservative Book Club in Washington, who was also in attendance, said he wasn't shocked by Boehner's departure. He posited that Boehner very likely saw his organization of the pope's address to Congress as "the pinnacle of his success as speaker" and said that Boehner was no conservative. "I think there are sort of elements of conservatism that he's incorporated into his political philosophy, but a bona fide conservative — no," Miller said. "I think he's more of a pragmatist, deal broker than a true ideological conservative." Tony Perkins, whose Family Research Council Action organizes the Values Voter Summit, said Republican leaders have, for too long, been "waving a white flag." "American voters who put the Republican Party into the majority have grown weary of GOP leaders running into these political battles waving a white flag," Perkins said in a written statement. "If Republicans will not fight to end taxpayer funding for an organization that is trafficking in baby body parts, and possibly infanticide, what will they fight for? We welcome Republican leadership that understands that some values, like life, religious liberty and national defense are worth fighting for — no matter what." Some presidential contenders piled on. Ted Cruz credited base voters, like the ones in attendance, for Boehner's ouster. "You want to know how much each of you terrify Washington?" Cruz quipped. "Yesterday, John Boehner was speaker of the House. Y'all come to town, and somehow that changes. My own request is can you come more often?" Former Arkansas Gov. Mike Huckabee tweeted that the establishment in Washington needed to be "burned to the ground." The divide within the GOP was on full display across town at the Capitol. Conservative legislators with Tea Party roots declared a measure of victory. Tim Huelskamp of Kansas tweeted simply, "Today the establishment lost." In the Capitol, Huelskamp added that Boehner stepped aside because he feared he couldn't survive a vote to vacate the speakership. A motion to vacate was introduced in July by North Carolina Republican Rep. Mark Meadows. It was "clear," Huelskamp said, "if a vote was called, he didn't have the votes unless Nancy Pelosi helped him out." Rep. Thomas Massie of Kentucky, another Boehner antagonist, said, "This is a condition of his own making. The American people can see through what's happening up here." He called the way Congress is run a "farce" and "theater." Huelskamp followed up on Twitter saying that Boehner now has a decision to make about Planned Parenthood funding. Conservatives want government funding stripped out before any funding measure is allowed to pass. Something has to pass by next Friday or the government will shut down. Not everyone was happy about Boehner's resignation. He has plenty of allies on Capitol Hill. Boehner said in his resignation news conference that he was certain he could hold on to the job, but didn't want to subject the "institution" to a vacate vote. "Those within our party, who insist on dividing us can take a small victory today," said Florida Rep. David Jolly. "It's unfortunate." Jolly said he believed Boehner's resignation made it far less likely there would be a shutdown next week, because "the 'shutdown caucus' has a small victory." Rep. Steve Womack of Arkansas warned that Boehner stepping down, however, wasn't likely to change much. "It's a difficult conference to manage," Womack said, noting that the "undercurrent [of] the extreme right [has] a sufficient voting block [to] put significant pressure on the outcomes of our conference." He added, "The next speaker is going to face the same difficult task of keeping a very broad conference together. You can change the faces and names and leadership chairs but the pressures are going to be the same." NPR's Arnie Seipel contributed to this report.